Last Sunday, September 6th, we drove eight miles out to the village of Sutton-on-Trent, where the locals were putting on their village festival. 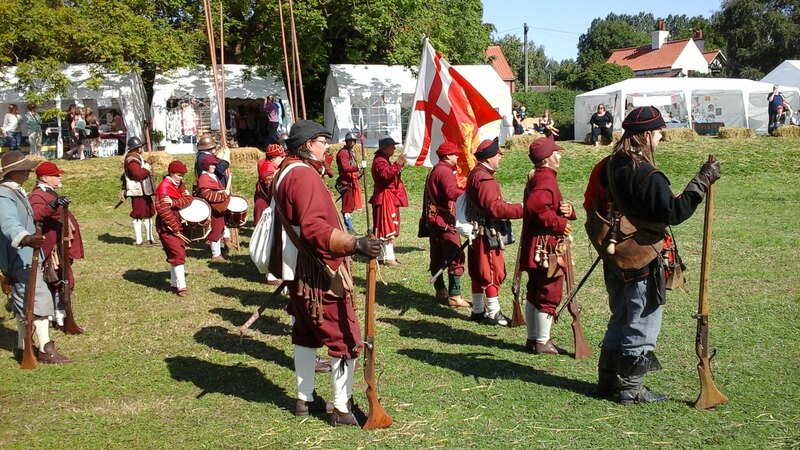 But this was a village show with a difference, because it was visited by a regiment of the Sealed Knot. 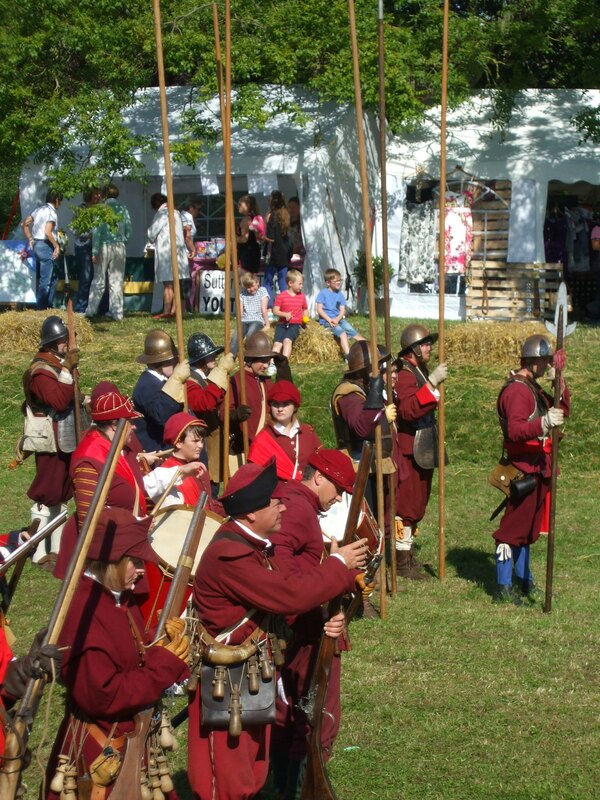 The Sealed Knot is the oldest re-enactment society in the UK and the single biggest re-enactment society in Europe. It aims to honour those who died in the many battles of the English Civil War (1642-49) and to educate people about those battles and the life of people during that period. Events are staged throughout the country all year. The name, The Sealed Knot, comes from that of a secret association that aimed to have the monarchy restored during the Interregnum/Commonwealth – the period between 1653 and 1659, when the country was governed by a Lord Protector, Oliver Cromwell. The present society, however, has no political affiliation. The show was held on Saturday and Sunday and both days were well attended. A variety of stalls and exhibits were arranged around the outer edge of a village field, including local produce, farm machinery and vintage cars and motor cycles. There were also several refreshment stalls. All in all we had a really fun and interesting time. It was sunny and warm, and the ice creams we had really made my day! I love the cars, can I have one please! Would love to see the equipments up close must have been fun. Men never grow up when it comes to cars … or motorbikes. We just have to smile tolerantly and let them get on with it. The vintage ones are rather brilliant, though. Haven’t been to a village show, only some festivals. This one served as both – only small as ‘festivals’ go, of course, being a small village. Wow! Nice! I’ve always wanted to have an ice cream from an ice cream van, but sadly we don’t have them here… maybe when I’ll be in UK, I can have one… any particular flavour you’d recommend? Looks like a lovely show and great to find a good day for it in our miserable summer. Thanks, Bekki. 🙂 It was such a lovely day, and everyone was in such a happy mood – amazing what a bit of sunshine does. For a small village, they’d put on a good show, although the horticultural offerings weren’t the best I’ve seen. The vintage cars and buses were great and the Sealed Knot did the best they could with such a small company. It’s just so nice to get out and about, isn’t it? What a beautiful post. Love the picture tour! Look! Book tent (that’s where I’ll be). Hi Jack. Thank you for those kind words. 🙂 As for the book tent, I don’t think you would have stayed in there too long! There were a few fiction books, but most were pretty dated, and a few non-fiction. But most seemed to be children’s storybooks and cookery books. Nothing ‘to shout home about’, as e say over here. It was just a nice, colourful and happy day out. When you posted this, I was in the Emergency with my husband. He’s still there and I’m waiting for the results of the arterial scan in his right leg. Keeping fingers crossed. Hope you can cool down in the sea. Oh, Irina, I’m so sorry to hear that. I’ve only just got to this comment, and I hope your husband is alright! What a worrying time for you both. Hugs and much love to you, and I hope the results of the scan were good ones. I too love re-enactments Millie. Especially significant historical events. Wonderful post Millie. I always learn to much from your historical posts! That’s brilliant Millie. It would be like reading a book with a heartbeat! Did they serve vintage refreshments, such as the Oliver Cromwell slurpee or the infamous Sealed Knot cola? I suppose you could describe ale as ‘vintage’ – at least the idea/usage of it, if not the more recent brews! Malta, how exciting! Perhaps they have Ollie Cromwell slurpees there (though I’m not sure how to ask for it in Malti). Certainly you will find the peppery taste of Falcon cola in the best establishments. Enjoy your trip. Try to avoid copious amounts of unregulated Maltese ale. Yet another thing we have in common: an instinctive dislike of ale, regardless of provenance. Yes, the least people living in foreign countries can do is have the good sense to speak English. For all of you history buffs out there, here is a bit of an hors d’oeuvre from Millie Thom’s style of posts. 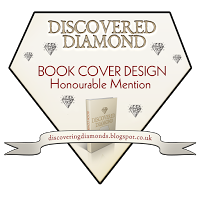 She is an author of historical fiction novels and has a passion for everything historical! I feel as though I have just seen a documentary when I read her posts. Passion for something really does come out in people’s writing. I think we all learn so much from each other – and about each other – through our posts, Bee. (What a lovely name). I love to share ideas and thoughts with fellow bloggers, and your writing is inspirational, too. I like the way you explore characters and throw them into a variety of situations. I also like you broaden your stories with interesting and sometimes humorous little sub-plots. That you love to experiment with your writing to me is the sign of a good writer and I’m sure you’ll do really well with your first book. I read one of your stories before we went off to Gozo this morning, and hope to catch up with others as soon as I can. Thank you for following me the other day, too. I noticed that just before we left for Gatwick Airport. Everything you have said is so true Millie! I actually never stopped following you, but I worked out I needed to be a little bit wiser with how I was managing my blogging. Since I began, I’ve been following anyone that follows me and I have also followed people myself. In essence, it made me a ghost follower of some people. I’ve created lists for people that include people such as yourself, but I literally had to start from scratch in identifying who I should be following. It’s impossible to keep up with 1200 people’s blogs. By just following people, I’m actually doing people a disservice. If you have 100 people following you but only 3 people ever read your posts, that isn’t a true indication of who your followers are. It should be about the content of your posts, not how many people are following you. It’s been another huge learning curve for me. I’ve learnt so much since I’ve been blogging. It really isn’t about the number. It’s the discussions within comments that count! I agree completely. Having followers, and following others ourselves, is little use if we don’t interact. The comments are so important to us all. The like button might be good for the stats, but somehow a ‘like’ means so little without a comment – and the discussions that ensue. I love this post! So full of amazing photos! The history made so interesting and beautiful through these pictures is amazing! I learn allot and also have fun. The Sealed knot is so interesting and what a fantastic experience to be able to see all of this and experience it!! Thanks Millie! Thank you, again, Lynn. I’ve become very snap-happy this summer. I’m quite new to photography and I’m loving experimenting. your pictures are very good!!! Oh yes that does help! Wow she must be really good! wow! amazing! What is her blog name I will go see her photos! (I’m not sure the link will work. )Thank you, Lynn! wow nice, I will try! I love it! wow amazing and gorgeous! Yes I am looking and lovely art work on the front!! Yes, she does love to draw and paint, too. She has some wonderful landscape pictures – full size ones, I mean. She just hasn’t had time to paint recently. wow the cover picture is wonderful!! can’t wait to look around more! so much talent like her mom! Talking of cones, I had no idea that cornet was a proper word. We do get cones here (some really amazing ones) and we call them corneto(s), without even realising that it actually means cones. We have a lot of British influence here, and I guess it’s quite explainable given the history… hehe! I love Italian food, too, and loved all pasta dishes in Italy. As for British influence in India, it’s the same in Malta. The British were in Malta for 200 years (until independence in 1964) so it stands to reason that the second language on the Maltese Islands would be English. Even the Germans, Polish and French etc. use English when talking to local people. It’s become the International language, I suppose.